How can Emerald help me? Emerald contains academic/theoretical articles for a number of key business and management journals. How can I access Emerald? How should I search Emerald? Emerald is one of our key Business and Management Journal Databases available for you to access via the MBS Library page. Resource guides outlining how to use Emerald as well as guides to all our other online resources are available from our “How to Research Guides” web-page. Simon Linacre and Ruth Bailey from Emerald recently visited MBS for a presentation/workshop on getting published (and understanding journal rankings). The first part described how articles are handled from a publisher’s perspective and offered several important tips for getting published. Consider your potential reader – most people only see the title (and abstract) of your paper through a search engine – Will your target readers want to find out more? Consider your editor and publisher – follow the author guidelines! The second part discussed where to publish and specifically the influence of journal rankings. In the UK the forthcoming REF research assessment will use either ISI (Thomson Journal Citation Reports) or Scopus (Elsevier). Some countries only consider ISI journals, Australia is compiling its own index, UK has the ABS (Association of Business Schools) ranking list, while in the US Scopus and ISI have limited impact. There is growing use of Google scholar as a source of publication impact data but it will be some time before this is an influence at the national level. Simon’s advice was to be aware that universities are very interested where their staff and students publish as it influences their ranking, but remember that it is your career (you may move somewhere with a different ranking). Among the discussions, the most discussed topic was the influence of open access publishing and institutional repositories. This is going to have an influence over the next few years. Emerald like most publishers is watching how things develop. The Emerald e-journal database is the best choice for the Journal of Service Marketing because there is no embargo so the most recent issues are available. The Journal of Services Marketing is one where the library has subscriptions from several suppliers but the conditions are not identical. In this case one supplier, ABI/Inform (Proquest), has a 1 year/365 day embargo while another, Emerald, has two different access points depending on the year. 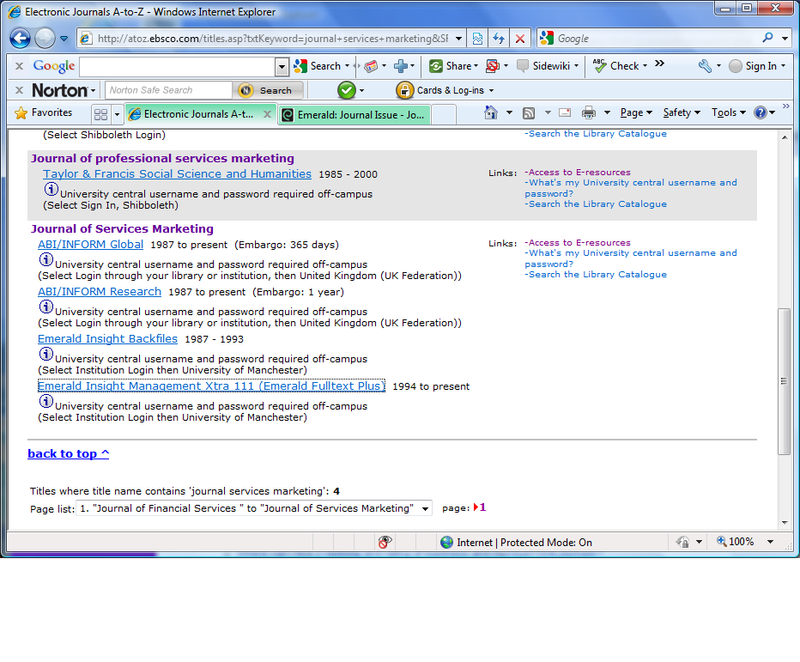 Electronic journal A-Z list results for “Journal of Services Marketing”. Click on the image to see in more detail. Note that the information below the supplier link gives additional information about accessing the relevant resource off-campus. For recent articles, within the last year, you must use the Emerald Insight Management Xtra 111 link. For older articles, you can select ABI/Inform or Emerald depending on your personal preference.